Why do samples need to be shipped in pSB1C3? Instructions on how to fill out the Registry's submission form. Registry groups are provided with a submission kit to ship their part samples. Have questions on requirements or shipping part samples? 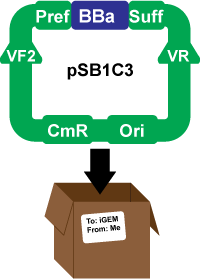 Check the FAQ or contact us at hq (at) igem . org . 1.1 Why should I bother with packaging when it's extra effort? 3.1 Why is pSB1C3 the shipping standard? Having a shipping standard backbone lets the Registry receive and handle all parts in the same way: using the same growth conditions and quality control measures. With over 1000 new parts submitted each year, this improves our ability to handle, maintain, and test new parts. When anyone uses the part, they'll know exactly what to expect. They can easily unpackage it from the shipping plasmid backbone, and transfer it into a different backbone for a specific use. When you buy a book from Amazon.com, it comes packaged in one of their standard cardboard boxes. and you could read the book as soon as you get it in the mail. No need to open any packages! Why should I bother with packaging when it's extra effort? Once you receive your book, you'll toss out the packaging and start reading! Or maybe you'll put it on your book shelf, or let a friend borrow it. When you actually start using your book, the packaging doesn't matter anymore, but it's very important to the way your book is shipped. The Registry takes this same approach to parts: packaging is an important step in sending and receiving parts and when you're ready to use those parts it's easy to move them out of their packaging. In traditional microbiology, a researcher sends out their DNA however they want. That leaves the receiver to figure out how to handle it: maybe they don't have the right antibiotic, restriction enzymes, or strain. Maybe they're entirely unfamiliar with the system the DNA is in, and have to research it before use. Synthetic biology uses standardization to reduce this unneeded complexity. We standardize the way parts are sent and received through the plasmid backbone. All parts shipped to the Registry must be in pSB1C3, the Registry's standard shipping backbone. Why? Why is pSB1C3 the shipping standard? pSB1C3 is a well-known plasmid backbone with a lot of user experience behind it. It has several features which improve the Registry's ability to process shipped parts, and the end-users ability to use those parts. The BioBrick standard is time-tested: users can easily and reliably transfer or assemble parts into a different plasmid backbone. For quality control, we can use the same set of primers (VF2 and VR) to sequence into all shipped parts. Users can also use these primer sites for sequencing of parts, or if they wish to PCR the part from the plasmid.